Over 90% of your customers will research online before making a purchase. 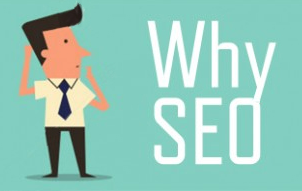 The most valuable SEO real estate is Page #1, Position #1. Over 36% of all the clicks go to #1 position. Positions #1, #2 and #3 get over 57% of all the clicks. Over 70% of people searching will click on a Page #1 search result. Page #2 and #3 get only 6% of the clicks. SEO, search engine optimization, is the process of creating compelling content and configuring the content is such a way that the search engines know what the content is about. There are many technical aspects to SEO, but without superb content, the technical won’t help your page rank on Google. Google gets over 3.5 billion searches per day which results in over 350 millions paid clicks per day. That’s a lot of clicks and Google needs lots of content to attract those clicks. This is the foundation of SEO. How to make your content be the #1 choice for Google for your important keywords. When someone does a search on Google, the phrase they use is called a “search query”. Keywords are the key phrases on your website that you want to align as closely as possible with the “search query”. 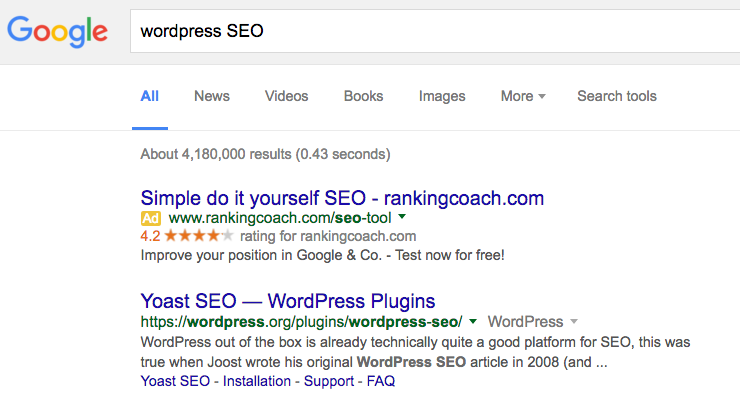 You can see that the search query is “WordPress SEO”, and the exact phrase “WordPress SEO” comes up in the URL and the content of the first search result. The closer your keywords match the search query the more likely your page will rank higher in the search results. Why doesn’t your website get more traffic? Contact John today. How closely does the keyword describe your product or service? Let’s look at an example: You own a retail tire store. The first organic result has this as the title in the result: “Best Tires For Toyota Tundra at Tire Rack”. The keyword “Toyota Tundra” is repeated 31 times and the word “Tire” is repeated 320 times on the page and in the source code (what Google sees). The best way to find out how much traffic your keywords can get is to use Google Keyword Planner Tool. Using the Google Keyword Planner Tool you can put in your keyword  and find additional keyword suggestions , how much traffic goes to each keyword , how competitive the keyword is  and the value of the keyword . You can research many keywords at once. You will be able to judge the real value of your keywords based on how much they are worth, how competitive they are and who your competitors are for that keyword. How many competitors are looking for this keyword? A very competitive keyword means that your competitors get value from visitors with that keyword. The downside of that is that lots of websites are optimizing for that keyword. The trick is to find the keywords that you can reasonably get. 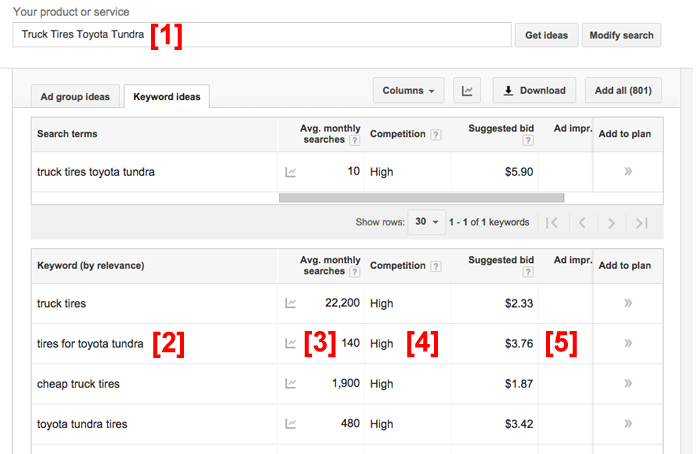 You find these keywords by looking at and researching the websites in positions #1, #2 and #3. If you can compete with those websites then optimize for that keyword. If the websites in positions #1, #2 and #3 are too competitive then modify that keyword until you find the right combination of competition, traffic and relevance for your keywords. Google uses the context of the search query to deliver the right pages to the searcher. Is your content directly targeting the search query? For example, if the searcher is looking for “Best SEO Services”, the content on your page should be about “Best SEO Services”. What is the searcher really looking for? What is the real purpose of the search? Here is where context comes in. Where is the searcher? Are they looking locally or nationally. What are they looking for? Tips, answers, solutions. Where are they in their purchase process? Are they looking for information or are they ready to buy. Google also knows that “search engine optimization” and “optimize for search” are both synonyms for “SEO” and will return highly rated web pages with these synonyms. There are many websites where you can check the SEO authority of your website. I like Moz Research Tools. You can find your Domain Authority , the Page Authority for a specific page , and great information about your backlinks . A high authority website has very high quality content that has a lot of traffic, is shared on social media and is linked to from other websites. Do your visitors like your website and find it useful. Do they look around, visit multiple pages, watch your videos, download your white papers, or fill out your contact form? Mobile First is Job #1 for SEO. Google has been very clear that mobile-friendliness is now a major Google Search ranking signal. Responsive design lets your visitors see your website on any device. Phones, laptops, tablets etc. Responsive sites “respond” to the width of the screen and reconfigure the page for maximum user experience for that device. Before you do anything on your site you need to design the “visitors flow” to get your visitor quickly to the content they are looking for. Map out your website with the focus keywords and your marketing funnel. Let’s take a look at Zappos.com, one of the most successful eCommerce sites today. Zappos has 6,030,000 pages. They have created a website architecture that lets their visitors find what they are looking for in about three clicks. The top navigation has their broad keywords; Shoes, Clothing, Men’s, Women’s etc. From the home page, as you hover over the broad keyword (Shoes), a very large dropdown appears with the sub-categories. The website is constructed with a keyword hierarchy that lets Google know very clearly what the website is about. If you look at a specific page, let’s say “Men’s Shoes”, you’LL see that the phrase “mens-shoes” is repeated 61 times in the source code. Google can clearly see that this page is about “Men’s Shoes”. 1. Page Titles: Google will use the page title as the title in the search snippet. Keep the keyword towards the front of the title. Add modifiers to your title like “best” “tips” “guide” etc. This will help you rank on the long tail keywords for your focus keyword. 2. Page Title as an H1 Tag: Google sees the H1 tag as the focus keyword for the page. Use only one H1 tag per page or post. 3. Metadata: Metadata is the invisible information on your website that tells the search engines what your page is about. Important metadata in the header are “Description”, “Keywords” and “Robots”. 4. Image Titles: Similar to the Title Tag, the Image Title Tag is a short sentence describing the image. Be sure to include a keyword in all your tags, but don’t overdo it. Google recognizes “keyword stuffing” and penalizes websites for it. 5. Image Alt Tags and Captions: Google uses the Image Alt Tag to understand what the photo is about (embedded in the page code as alt=”your keyword”). Image Alt Tags also describe the image for visually impaired visitors. If you use a caption, include your keyword if possible. 6. URL Structure: Use focus keyword in your URL. Keep the length to about 3 to 5 words and exclude any stop words like “for,” “and,” “the,” etc. 7. Strategic Keyword Usage: Google no longer just looks at your keywords. Google looks at how relevant your content is to the visitor’s search query. Google has a metric called LSI – Latent Semantic Indexing. LSI Keywords (also known as Semantic Keywords) are keywords that are not directly synonyms but are “similar or related keywords”. Is your visitor looking for fruit or a computer? LSI keywords for Apple might be “Apple Smartphone’” or “iPhone”. The keywords don’t have any words in common, but Google knows that they are related. 8. Outbound Links: Google expects that if you have a legitimate website you will be linking out to other websites. Be sure to add the “nofollow” attribute to most of your outgoing links. Without the “nofollow” attribute you are passing along some of your page value to the website you’re linking to. 9. XML Sitemap: Google is always looking for new and fresh content. A sitemap gets your website indexed faster and alerts the search engines to new or changed content very quickly. 10. Social Sharing Buttons: Social signals don’t directly impact your SEO, but they do drive traffic. For Google, the increased traffic adds to the authority of your website which in turn increases your rankings. 12. H2 and H3 Tags: These tags are not nearly as important as the H1 tag but I would recommend that you add keywords to your H2 and H3 tags where you can. 13. Internal Linking: Add links to 3 or more of your older posts whenever you publish a new one. Internal links help to reduce bounce rate, make your website easier for Google to index, and give your visitors more opportunities to engage with your content. It’s a win win win. 14. Drastically Reduce Bounce Rate: One quick way to dramatically reduce your bounce rate is to have internal links on your pages. Google records a bounce if your visitor lands on a page in your website and does nothing else. Of course, they could be reading your excellent content, watching a video or studying an infographic, but as far as Google knows they are not engaging with your site. Easy fix – add some interesting links so Google sees an interaction, and you have one less false bounce. 15. Content Length: It takes the average reader about 3 minutes to read 500+ words. Most people write about 500 to 800 words so that their visitor can read the complete content in around 3 to 4 minutes. The best SEO hack is super content that gives your visitor immediate value they can act on NOW!. This will keep them reading; they will get engaged. You have a much better chance of converting an interested and engaged visitor. Don’t be afraid to write lengthy well-illustrated content. Longer content attracts more backlinks and gets shared more. 2. Then they go back and read the content from an interesting headline. But… all your content needs to deliver a real solution to a real problem that your visitors can act on now. 16. Images and Videos: Your visitors will spend more time on your website if you have interesting graphics and videos. Google sees this extra time as “engagement” with your website. This is one of the most important onsite factors in Google’s algorithm. 18. Load Speed: The time it takes your web page to load is called “load speed.” Load speed is a very important ranking signal for Google. Keep in mind that “mobile first” is Google’s mantra. If your webpage takes more than 4 seconds to load you will lose over 75% of your visitors before they even get onto your website. You can check out your website’s load speed at: – https://developers.google.com/speed/pagespeed/insights/ . You can add CDNs (content delivery network) or caching plugins but the best way to ensure fast loading time is with a good hosting service. I use Siteground for hosting my website although I also like Media Temple and WPEngine for my clients websites. Here is an excellent review of seven hosting sites. This article goes into depth on how load speed affects SEO. Good read if you want to really get a handle on what load speed means to your SEO efforts. 19. Page Errors and Broken Links: You should monitor your website for page errors and broken links as part of your website maintenance program. I like to use ScreamingFrog.com to find errors and broken links. http://www.screamingfrog.co.uk/seo-spider/ This tool is free if your site is under 500 pages, and $150 for a Pro license. 20. Rich Snippets: With Rich Snippets, Google can display more information in the search results, including whether your page is a review, about a person, a product, business and more. Rich Snippets can be used on the following content types: reviews, people, products, businesses & organizations, recipes, events, music and video content. Offsite optimization consists of link building, engaging on social media, email marketing, and creating sharable content, all designed to drive traffic back to your website. A backlink is a link from another website back to your website. Offsite optimization is getting backlinks from other websites and blogs. Backlinks are “votes” for your website. The best backlinks are from websites that are quality, authority websites about your products or services. For example, if you sell computers then a website that talks about tech would be ideal. But if the website is about kids shoes, then that’s not a good backlink. You can build backlinks by creating great content that other sites will backlink to. This works, but can be very frustrating if your website is new or small. Just a word of warning: don’t buy backlinks. One of the worst penalties is a Google backlink penalty from trying to game the system. If Google detects “unnatural links” to your website you will be partially or completely de-indexed. Getting back into Google’s index after a backlink penalty is very difficult, expensive, and often not successful. Beat your competitors at backlinks. Contact John Bolyard today. How is Local SEO Different? If your business is local, your marketing and SEO should be focused on local search. Local search relies on local signals such as your NAP (Name, Address, Phone) in local directories, local reviews and social media. If you are optimizing for specific location (local area, city, state) be sure it is included in your copy, your sidebar and/or your footer if possible. Find all the local directories and add your business. Start with GoogleMyBusiness, then check out Whitespark.com Top 50 local directories. Be sure to add your NAP (Name Address Phone) exactly the same in every directory. If you add your address as “456 Treeview Drive” in one directory and “456 Treeview Dr” in another directory, Google will think you are two different business. Be sure to be EXACT! Local SEO relies strongly on reviews, Google+ and Yelp particularly. Actively ask your happy customers for reviews. Reviews add trust and authority to your business. Create content with a local spin, add directions and maps. Find the local online communities, get involved with what’s going on in your local area. Google drills past the city level into the neighborhood level. Identify the neighborhoods around you and add them to your content and directory listings. Link building should be for local links. Look for local chambers, business directories in your area, and social groups where you can add your NAP and a backlink to your business. If you want to grow your website traffic you need to track the results. How we optimized this page for SEO. Google Snippet: SEO connects your customers with your products or services. Generate more leads, increase your traffic and convert more customers. How this page fits into our marketing strategy. 1. Why doesn’t your website get more traffic? Contact John today. 2. Beat your competitors at backlinks. Contact John today. 3. Why you need killer content. Contact John today. 4. Keyword research drives over 90% of new traffic. Contact John today. 6. Weekly Tips, Tools and Exclusive Marketing and SEO Updates. Subscribe! 1 .Schedule your FREE 20 Minute Phone Consultation Today! 1. CTAs Increase Conversion: Talk to Us! 3. Weekly Tips, Tools and Exclusive Marketing and SEO Updates. Subscribe! SEO connects your customers with your products or services. Generate more leads, increase your traffic and convert more customers.